WolfPack Rentals – Get your brand out there. BIG. People ask us what we do: We are working to replace the commercial way of setting up for events, building houses, offering basics to the community. We create mobile housing solutions, bars, lounges, and other concepts to benefit society. We work towards a high-quality finish and move away from the basic low-class finishes at a competitive price. Take in some design inspiration. Got ideas? Share them with us – our in-house architects will make your brand activation the centre of attraction. 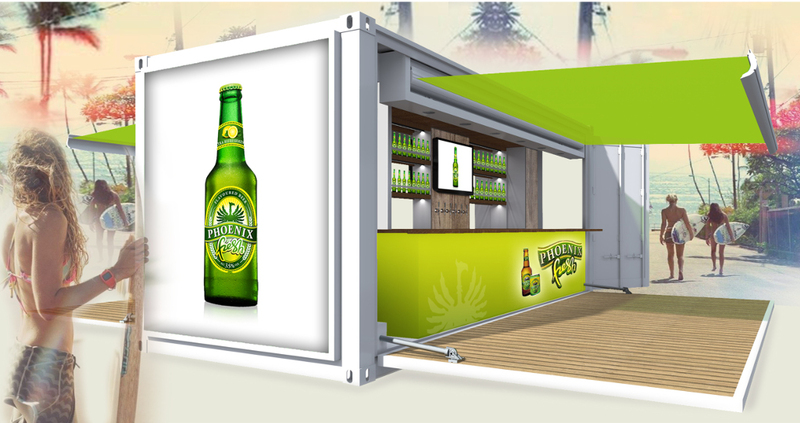 Ask about the possibilities of container conversions for impactful branding. A WolfPack converted container becomes a valuable marketing asset that can penetrate any market – wherever and whenever you need to have a powerful presence. For marketers with multiple brands, the flexibility of a WolfPack customised container really comes to the fore. Branding can be swapped in minutes. Simply replace the removable panels with Brand B’s branding one day, brand A’s branding the next. The real beauty? You can amortise the cost of ownership across various brands. Ask about buying a full customised container.